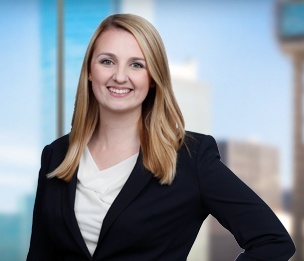 Alexandria Twiss is an associate in Dykema's Dallas office and focuses her practice on commercial litigation matters. Alex graduated from Texas Tech University with a Bachelor of Arts in Psychology. She earned her J.D. from Baylor University School of Law where she served on the executive board of the Baylor Law Review, earned multiple advocacy awards and participated on two mock trial teams and a moot court team. Assisted on federal multidistrict class action ligation representing thousands of corn farmers across the United States bringing claims against a biotechnology company arising out of the sale of two genetically modified corn varieties unapproved in major U.S. corn export markets. Assisted with the successful representation of a claimant in an expedited commercial arbitration on a breach of contract claim. Assisted in representation of Plaintiff in a breach of lease trial in the Northern District of Texas. Drafted dispositive and discovery motions, including motions to dismiss, motions for summary judgment, special appearances, default judgments, motions to exclude and various discovery responses and requests on numerous commercial litigation matters in state and federal court. Assisted in consumer arbitrations including preparing written submissions, participating in discovery, investigating legal theories and defenses, and discussing settlement opportunities with clients and opposing counsel.